It’s not that we didn’t have chances. We haven’t been completely devoid of great teams or talent. We’ve had moments and games which will live with us, ones that we talk about around a water cooler or draft beer. But while we have been in a enveloped in a season where every conversation about Virginia Cavalier basketball has started with the word ‘Since’, we add yet a few more to that list, making this year something we will never forget. The Hoos are playing basketball in New York, and more importantly, in Madison Square Garden. On the surface, it doesn’t sound like a big deal. MSG is the preseason and postseason home of the NIT Tournament as well as numerous mini-classics throughout the non-conference season. Even St. John’s play around 10 games a year in the hallowed arena each season against some top named opponents. But somehow the Hoos have missed out on all of the festivities in the City that Doesn’t Sleep for 15 years. It was a random afternoon game December 4th, 1999 when Virginia stepped into the Garden to play the end of a home-and-home with St. John’s since we’ve been in NYC for basketball. That day did not end well, with the Cavs getting routed by the Johnnies 85-63, a result that encompassed a very up-and-down year for Virginia. Oh, it’s not like we haven’t had the chances. While the recent Hoo faithful will remember last season’s two missed opportunities with losses to Delaware in the preseason NIT and Iowa in the postseason NIT to make it to MSG, it goes a lot deeper than that. Virginia has appeared in the NIT 5 other times since the last time we were in New York: 1999, 2003, 2004, 2005, and 2006. Each time, the Hoos did not make it past the 2nd matchup. You would think that in the seasons where Virginia had good basketball teams, the Cavaliers would have been invited to play in one of those mini-classics, but the matchup with Tennessee in the Jimmy V classic, now held at The Garden, was played in New Jersey in 2000. Now let’s dig into it a little bit further. While New York City has been a northeast college basketball mecca since the latest incarnation of MSG opened in 1968, this is the first time that any regional of the NCAA tournament has been played here. The western part of the state has been getting all the attention of the past half-century with Buffalo hosting 5 regionals and Syracuse hosting 10 regionals. 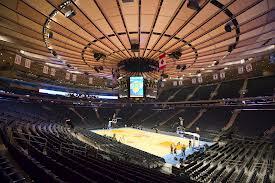 But to think that MSG has not been part of that equation since 1961 in the original Garden is unfathomable. With all of this history of missed opportunities, Virginia has another piece of unfinished business to attend to, literally. The Cavaliers opponent tonight is Michigan State, and while Sparty has already played in the Garden twice this season, Virginia remembers the last time these two teams clashed. It was a relatively calm night in 2001 when yours truly packed into his roommates car with other Wahoo students to head to Richmond to see the ‘neutral’ court matchup between Virginia and Michigan State in the ACC-Big Ten Matchup. It was a clash of two of the top teams in the country, with the emphasis on the post game, with our Travis Watson going against All-American Aloysius Anagonye. As a student, we had seats underneath the basket, and had to get there early to walk across the floor to our seats. I remember remarking to my fraternity brother that it was mighty cold on the floor, especially on a mild evening. Well thermodynamics, one of the few classes I was able to avoid as a Civil Engineer, was not on our side that night, as the moisture on the floor became so unbearable that the game had to be halted, then canceled. I never got my refund and Virginia never got to capitalize on their lead they had mustered. Now, years later, all the roads of Virginia basketball past and present converge into one 40 minute game with major implications. With success of basketball programs measured by postseason success, this Wahoo team has the opportunity to continue to write their name in the banners of John Paul Jones. Some might argue that this team has already accomplished the same or more than the 3 other major eras of ‘recent’ Virginia success (80s Sampson, 90s Stith, and 94-95 Elite 8), but how many opportunities will we get in the future? It was nearly 30 years between ACC Titles. Twenty years between Sweet 16 appearances. Seven years between NCAA wins. We want to believe that the Cavaliers will continue to have success on the court, but nobody really knows. Appreciated the opportunity, relish the situation, but take care of business. Keep the season alive.